In this section, we will implement the Edit Post page which contains the form allowing to edit the data of existing post, send new data to server and apply changes to database. Site visitor will be able to see the page by entering the following URL in browser's navigation bar: http://localhost/posts/edit/<id>, where <id> is the unique identifier of the post. create a form that would allow to enter post title, content, etc. For this page, we can successfully reuse the PostForm form we created earlier (we just rename the Create button caption into Save). and add the edit.phtml view template file that would render the form. // This method allows to update data of a single post. // Converts tags of the given post to comma separated list (string). Above, we have the updatePost() method (lines 8-19) that takes an existing Post entity, the new title, content, status and the list of tags. It then updates entity's properties and saves changes to database using flush() method. Note that the updatePost() method doesn't use the persist() method of entity manager, because here we have existing post, not a new one. Then, we have the convertTagsToString() method (lines 22-36) which takes the post, goes through Tag entities associated with the post and formats and returns the comma-separated list of tags. // This action displays the page allowing to edit a post. // Find existing post in the database. // Redirect the user to "admin" page. In the code above, we extract the post ID using the fromRoute() method of the params() controller plugin. 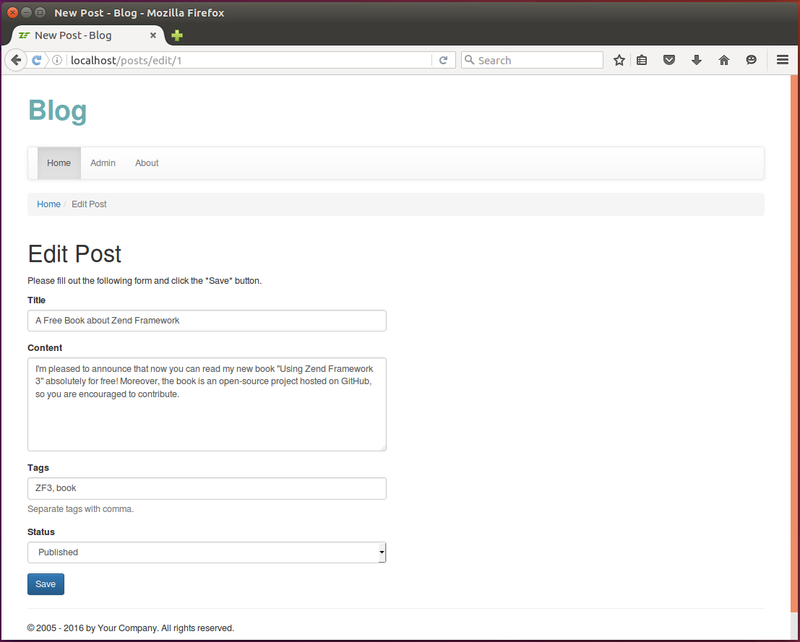 Then we search for post having such ID using the findOneBy() method provided by the entity repository. Then we check if this is a POST request. If this is the POST request, we fill in and validate the form with POST data. Then we use the updatePost() method of the PostManager service. Please fill out the following form and click the *Save* button. Clicking the Save button results in saving the changes to database.